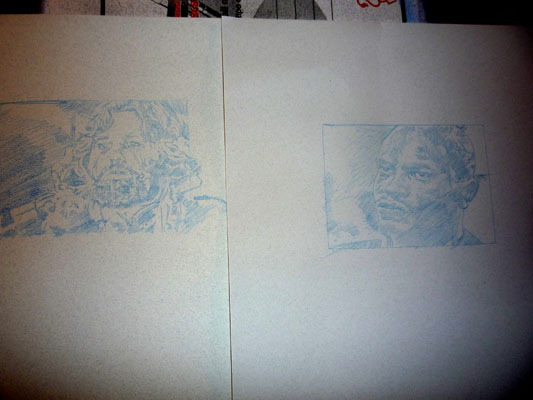 I’m doing a couple cards based on the movie The Thing, here’s the sketches. I’m trying to start working through the commission list, I know there’s a lot of people waiting so thanks to everyone for being so patient. I also wanted to throw in a quick thank you for everyone that pre-ordered the new book. Its now off to the printer and copies should start showing up around the beginning of September. I think that whole thing with my uncle Mike dying really threw me for more of a loop than I was willing to admit. Over the last week my heads just been spinning. I’ve been busy, but more than that, I’ve been in this weird, almost rethinking my life state of mind. The thing is though, I have a great life, I’m finally making my living as an artist, I’ve got a great wife, I like where I live and what I'm doing. I honestly don’t have many complaints, so there not a lot for me to rethink.